New genes identified in a significant proportion of affected people. Thursday 7th June 2018: Four genes have been identified which work together to cause cleft lip and palate, in an international research collaboration. The genes, associated for the first time with cleft lip and palate, encode proteins that work together in a network, providing important insights into the biological basis of one of the most common physical malformations. The NHMRC funded project was led by Associate Professor Tony Roscioli from Neuroscience Research Australia (NeuRA), Sydney Children’s Hospital, Randwick and UNSW Sydney; and Professor Timothy Cox, from Seattle Children’s Research Institute and the University of Washington School of Medicine in the USA. Representing about 70 per cent of cleft lip and palate cases worldwide, non-syndromic cleft lip and palate typically occur in isolation without other physical abnormalities. This craniofacial malformation has long been considered to be caused by a combination of many common genetic variants and environmental factors, each contributing a small amount to the risk of a child being born with a cleft. Using next-generation sequencing, the research team identified variants in four new genes, each representing a primary cause of non-syndromic cleft lip and palate. These genes are known to encode proteins that work together in a network, providing important insight into the biological basis of the cleft lip and palate. Variants in these genes were found to account for 15 per cent of the families who took part in the study and in nearly three per cent of a second, larger group of smaller families and isolated cases. Published in the American Journal of Human Genetics, the study provides the first evidence that a significant number of non-syndromic clefts have a single gene basis and not a complex basis as previously thought. A/Prof Tony Roscioli said cleft lip/palate is one of the most common human malformations, occurring in one in 800 children. “That equates to about 250 Australian children each year and one affected child born every three minutes worldwide,” said A/Prof Roscioli. “What we were seeking to identify in this study was whether single genes could cause a cleft lip or palate in families where there were multiple affected people. Commenting on their breakthrough, Professor Timothy Cox said prior studies had focused on using large numbers of affected individuals without an obvious family history, searching for common genetic variants that are associated with an increased risk of a child being born with a cleft. 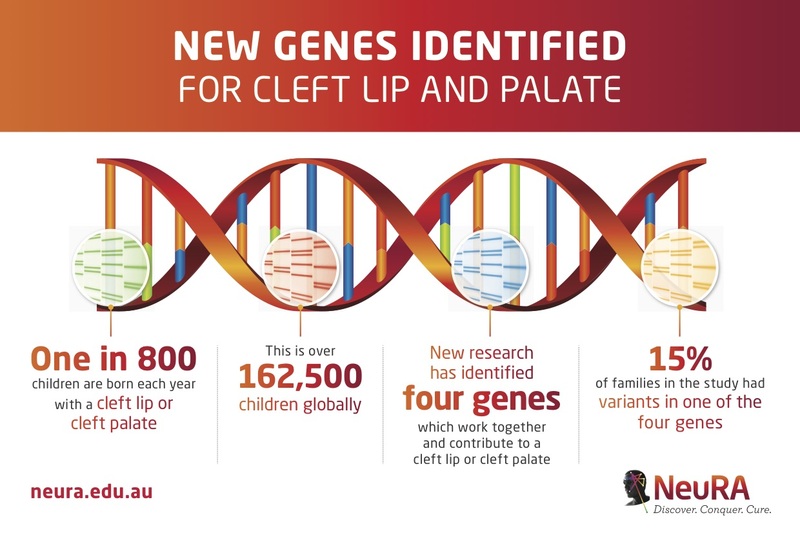 “We reasoned that non-syndromic cleft lip and palate occurring in families is more likely to be caused by a single rare variant that we can pinpoint using available new sequencing technologies,” said Professor Cox. “Importantly, we also showed that some affected individuals in this study had a gene variant which was inherited from neither parent – that is, it likely arose spontaneously in the affected individual during early development – and therefore the parents were able to be reassured of a very low chance of having another affected child,” A/Prof Roscioli said. Associate Professor Tony Roscioli is a specialist in clinical genetics at the Sydney Children’s Hospital and leads the Sydney Partnership for Health Education Research and Enterprise (SPHERE) GenomeConnect clinical academic stream. At NeuRA he leads the Centre for Research Excellence in Neurocognitive Disorders where he endeavours to transform the diagnosis and management of intellectual disability through genomics. Timothy Cox is a senior Professor in the Department of Paediatrics at the University of Washington School of Medicine, and a member of the Seattle Children’s Research Institute’s Center for Developmental Biology and Regenerative Medicine and Seattle Children’s Craniofacial Centre. His team seeks to understand how genes and maternal nutritional factors interact to control the formation of the unborn child’s face and how these factors impact a child’s risk of being born with cleft lip and palate. He hopes his research will lead to innovative approaches to reduce the severity or incidence of cleft lip and palate in newborns that carry a genetic predisposition to the birth defect.